This copycat recipe shows you how to make your own Starbucks Iced Matcha Latte at home with just three ingredients. I love this drink sooooooo matcha. Okay, that’s it for the matcha puns. I promise! I’m a simple gal when it comes to my caffeine drinks and generally not a lover of crazy coffee drinks or over the top Starbucks creations. However, I fell in love with this drink many years ago when I worked for a production company here in Los Angeles. I’ve never been able to shake my love for it. These days I make it at home several times per week. It’s super easy to make and all you need is milk (whichever kind you prefer), matcha powder, and vanilla syrup. I make mine a little fancy by using this vanilla bean simple syrup. Starbucks uses this vanilla syrup. I personally prefer the caffeine buzz I get from matcha versus coffee. No jitters and I’m more focused. Some people even use it as a dietary aide because it suppresses your appetite. To mix the green tea latte, I like to use my handheld milk frother. It is hands done one of my favorite kitchen tools that cost less than $10. I also used it to make my Lucky Charms Cereal Milk Latte. If you don’t have one, mixing with a regular ol‘ spoon works great. Update: I’m adding a few tips and techniques that can help you make your Matcha lump free! I can’t have matcha but my hubby loves these lattes! I can’t wait to share it with him. I adore a good matcha latte! These look fantastic! Either I did this wrong somehow or this is better done in a small blender or with the milk frother. With just a spoon alone I’m getting too many bits of matcha. Still a delicious drink though. Sorry you had trouble, Tyler. I just updated the post with a few tips to help you make your matcha lump free next time. Ok to use a blender for this, my all time fave…. Absolutely! That makes it super easy. Hope you enjoy it! I thought Matcha had to be brewed first to reap the antioxidant benefits? I used a small metal wisk. You get too many clumps if you use a spoon. I have to say that we never use vanilla syrup (unless you ask). We used to use simple syrup to make our lattes, but the company updated the recipe of the matcha powder, making it more sweeter. Thus, we opted out on using syrup to make the lattes because of the sugar crystals mixed in to the matcha powder. Only the green tea frappuccinos include simple syrup because it gets watered down eventually from the ice. This is the best. I love matcha lattes. I put mine in a 16oz. Mason jar. I add all ingredients even the ice, then I shake the mason jar. With the lid screwed on tight, of course. Usually a minute of shaking works. Any bits of matcha that don’t get incorporated will sink to the bottom, then you could just shake them up again. I drink it straight from the mason jar. I agree, hands DOWN this is as good as the best iced coffee! Can I use a handheld immersion blender? I used to drink matcha lattes when I lived in Japan! So good! I have never made them myself, though. I don’t know what I am waiting for, because they are so good! Can you just use vanilla extract instead of vanilla syrup and if so how much? No, they’re not the same thing. I would just use another liquid sweetener such as honey or agave. I bought some Macha because I wanted to start getting the benefits of Green Tea and I don’t really care much for tea. Anyway, I bought a jar of it and was immediately turned off because of the smell, so I got some empty capsules to fill. I was searching for recipes and found this. LOVE it. Now I can drink it!!! Thank you! I may try it with peppermint syrup. Do you think it would be ok to use sugar free syrup? Have you tried any other flavors for a variety? Sure, I think sugar free syrup would look great. I haven’t tried any other flavored syrup, but if you do, please let me know how it turns out. Enjoy! Actually, Starbucks doesn’t use any kind of flavored syrup. They use what’s called simple syrup, which is concentrated sugar melted into water. I was a barista there for several years in Hawaii and this was my favorite kind to make. I also recommend trying the Matcha Cremé Frappuccino. It’s like the iced latte, but better! I just saw this recipe and ran into the kitchen to make it. Delicious! I think I will try another one later today. Love it! I love this Starbucks drink, too. But I don’t know what is the best brand of matcha to buy!??!?! I feel you, Brianna. When we first started buying matcha we didn’t have a clue about quality and ended up with some not so great stuff we had to throw out. As far as brands go, we really like Encha (you can find them on Amazon or order on their website). Use their latte or ceremonial grade for this recipe. Hope you enjoy! A tablespoon or so (to taste) of Torani (brand) peach syrup is EXCELLENT in iced matcha green tea. I haven’t yet tried vanilla, but since I love it in coffee, it should be good in this as well. I don’t understand, if this is latte, so where is the coffee?? 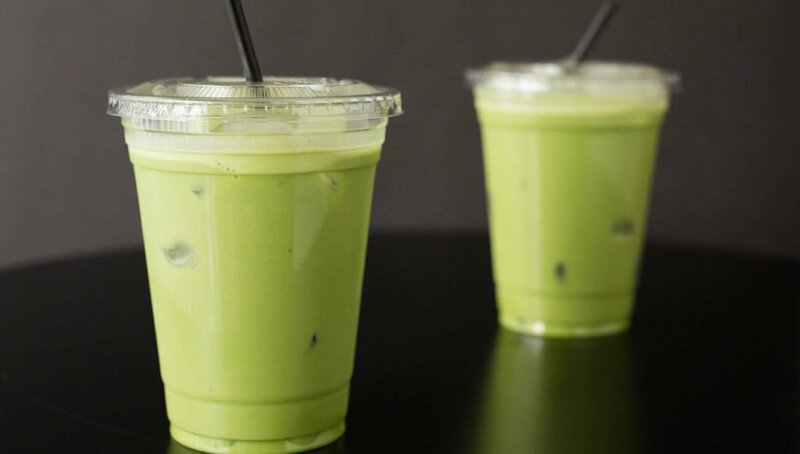 Matcha & other tea lattes that contain no coffee are very common these days. If you want a matcha latte that also has coffee, I’d recommend our Matcha Espresso Fusion recipe. I love it but when I make it at home I use stevia vanilla cream in the dropper instead of vanilla syrup! Thank you for sharing! Frothy, creamy, & delicious. Literally shake and go on hectic mornings and I never have to spend $4 – $5 on one at Starbucks again. Do you have a preference for a specific brand? About to give this a go with Tenzo Tea’s matcha powder and want to make sure it comes out ok. Their health benefits look pretty rewarding. Great question, Kelly! I usually use Encha matcha. I have worked with them in the past and am really blown away by the quality of their matcha. I haven’t tried Tenzo so I can’t speak to it. 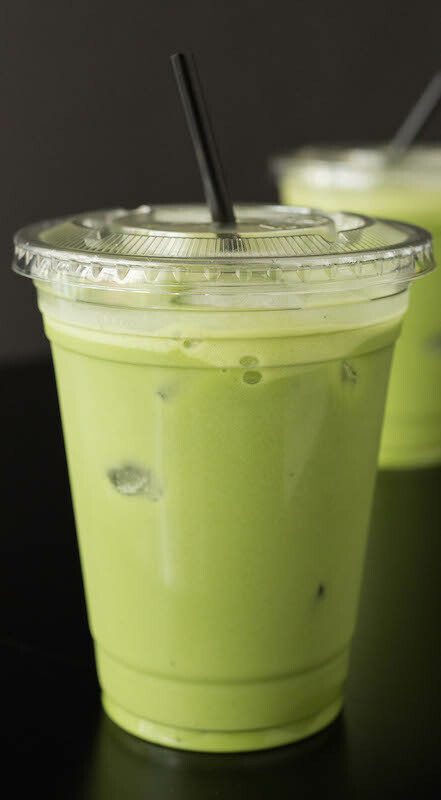 In general, if you want a great tasting matcha drink, you should be ceremonial grade matcha. It is the highest quality. I always get the HOT matcha latte at Starbucks. No syrup added. They put sugar in the Matcha powder. It is delicious. Absolutely it can. Just heat up the milk and mix in the matcha mix. You can add additional simple syrup or sugar if needed. The mix I buy is already sweetened so it’s not necessary. Island Teas sells a matcha mix on eBay that you can get with sugar or with a non-sugar natural sweetener.